Sage 50 CIS lets you easily control CIS subcontractor payments and monthly HMRC returns for the new Construction Industry Scheme. Buy your Sage 50 CIS software from Site4 and accompanying Sage 50 Accounts software if required. We have years of experience working with the construction industry dealing both with accounts and IT systems in general. Site4 are fully accredited authorised Sage resellers and are an award winning Sage Accountants Club Accredited Partner.We are fully accredited authorised resellers of Sage software including Sage 50 Accounts software, Sage 50 Payroll software and related products. Click here for Sage accounting and payroll software and details of software support cover for all Sage products, Click here for details of Sage HR (personnel) and P11D software or please Click here for Sage Training. The original Sage 50 CIS Module for use with Sage 50 Accounts software (previously known as Sage Line 50 software was developed as a construction software solution for smaller businesses who wanted to automate the new CIS (construction industry scheme) requirements introduced for tax year 2007/8 by HMRC. The Sage 50 CIS software is a module that adds onto the Sage 50 range of software, that lets you easily control CIS subcontractor payments and monthly HMRC returns. 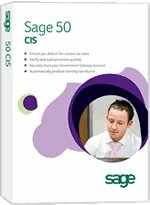 On 19th April 2016 some of the most significant legislation changes to CIS legislation came into force and as a result Sage have brought out a new Sage 50 CIS Module. To run the Sage 50 CIS Module you will need a copy of Sage 50 Accounts, Accounts Plus or Accounts Professional (previously known as Sage Line 50 Accountant, Accountant Plus or Financial Controller) v2016 (v22) or higher - it WILL NOT work with previous versions of Sage 50 Accounts software. You should also ensure that you stay on the most up to date version of Sage 50 Accounts with support if you are going to use the CIS Module. We can also sell you Sage 50 software or upgrade your existing Sage Line 50 software to the 2017 perpetual licence version or new Sage 50c Accounts or Accounts Professional subacription licence. Bundle prices available. See below for more details or call us now on 01257 460018. From April 2017, the UK Government are planning to announce further changes including compulsory online verification of subcontractors. The new Sage 50 CIS Module makes handling invoices and payments to subcontractors quick and easy. It is fully compliant with the latest legislation changes and CIS returns can be submitted online to HMRC in just a few clicks. It is also simple to correct any errors and re-submit. - Comply with the latest regulations and get guaranteed cover for future changes in 2017. - Seamless processing and submission of your CIS returns direct to HMRC in just a few clicks. - Amend and resubmit at the touch of a button. - Easily enter batch supplier transactions. - Automatically produce your monthly sub-contractor payment statements. - Sage have also got updates coming soon to simplify how you record Part Payments and will make sure new legislation is covered. In a nutshell Sage 50 CIS will help save time and effort in complying with the monthly procedures required for anyone employing sub-contractors in the construction industry. It's a no-brainer really and one to just get on with especially if you already use Sage 50 Accounts software. Click here to buy your Sage 50 CIS software from Site 4. If you have the old Sage 50 CIS Module developed over 6 years ago you will need to change to the new Sage 50 CIS Module that is available to buy on a monthly subscription for £10 ex Vat per month. The original CIS Module is no longer compliant with the new legislation. The biggest change is that you need to be able to amend mistakes in a previously submitted CIS period – and then resubmit a correct return online to the HMRC and the original CIS Module doesn’t allow you to do this – and as such is no longer legislatively compliant from 19th April 2016, so you need to upgrade to the new module. For more details about how the CIS Scheme has evolved over the years click here. In order to quote you we require your existing Sage license key, the name and address the software is licensed to, the existing product details and what you would like to upgrade to. If you need to buy Sage 50 software as well as the Sage 50 CIS module contact us for a bundle price! We have years of experience working with the construction industry dealing both with accounts and IT systems in general. If you require help installing your Sage 50 CIS software, on-site support, training or any other assistance for your Sage products please contact us at Site4 as we will be happy to quote you. We can provide on-site services in Lancashire, Merseyside, Manchester and North Cheshire and further afield across the UK if required. We can also offer assistance with running your management accounts, purchase and sales ledgers, generating invoices and running your payroll.